Weight loss surgery reduces the risk for some of the poor pregnancy outcomes caused by obesity while increasing the risk for others. The resulting weight loss after a procedure can also improve fertility by repairing the obesity-related irregularities in ovulation. Pregnancy after weight loss surgery is safe with the right prenatal care and special attention to adequate intake of nutrients and calories. 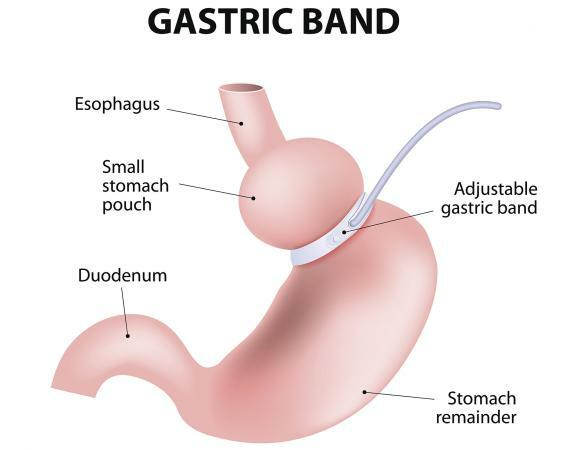 Weight loss (bariatric) surgical procedures for the obese include gastric bypass, gastric sleeve gastrectomy, adjustable gastric band, and iliopancreatic diversion with duodenal switch (BPD/DS). The literature on the effect of these surgeries on pregnancy outcomes is not extensive, and the conclusions vary. However in general, based on studies such as one published in 2015 in the New England Journal of Medicine, there is a consensus on the effect of the procedures on various aspects of pregnancy. These pregnancy outcomes compare to a higher risk for gestational diabetes, hypertensive disorders of pregnancy, birth defects, miscarriage, premature birth, stillbirth, and newborn death in obese pregnant women. Obesity is associated with irregular ovulation and menstrual cycles in some women, resulting in problems with fertility. A 2012 article in Seminars in Reproductive Medicine reviews evidence that weight loss after bariatric surgery can improve obesity-related irregular ovulation in affected women and improve pregnancy rates. There is not enough data on how long a woman should wait after weight loss surgery to get pregnant. The above Seminars in Reproductive Medicine article writes the literature consensus is to wait 12 to 18 months after the procedure until weight loss stabilizes. This avoids the more rapid weight loss and significant nutritional deficiences that can occur during the early months after surgery. Bariatric surgeries restrict the amount of food the stomach can hold and therefore reduces nutrients and calorie intake and might also cause poor absorption of nutrients from the small intestine. During a pregnancy, this results in an increased risk for maternal nutritional deficiencies, including in essential vitamins and minerals. These nutrient deficiencies can affect the health of a mother and the growth and normal development her baby. There is little information on the effect of each type of bariatric surgery procedure on the outcome of pregnancy. Most studies in the literature include women who underwent various surgeries in the study group. Each procedure has its own risk of complications based on how the surgery is done, but all appear to have similar effects on the outcomes of pregnancies as outlined above. The American Society for Metabolic and Bariatric Surgery describes the common following procedures. A gastric pouch is created by stapling or cutting a small section of the upper part of the stomach to separate it from the rest. The small pouch is then connected to the lower part of a divided small intestine, by-passing the rest of the stomach and upper small bowel. The upper cut end of the small intestine is reconnected further down the lower small intestine so that enzymes and acids from the lower stomach can help with digestion. The small stomach pouch can only hold a small quantity of food, thus restricting intake of food and calories. Bypassing a large portion of the small intestine also leads to poor absorption, or malabsorption, of nutrients. Because of the poor absorption of nutrients in the small intestine, there is a greater chance of nutritional deficiences from a Roux-en-Y gastric bypass than from the sleeve gastrectomy or gastric band procedures. 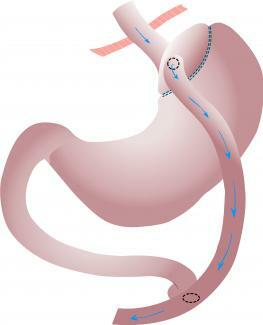 Similar to a sleeve gastrectomy, a large portion of the stomach is removed. The remaining small, tubular stomach pouch is attached to a separated lower portion (about one quarter) of the small intestine. The stomach contents thus bypass the upper three quarters of the small intestine. This upper small intestine is also reconnected to the separated lower small intestine so pancreatic enzymes can drain there to help food absorption. Because of the adverse effect on adequate nutrition, pregnancy after weight loss surgery is considered high risk. In addition, surgical complications of a weight loss procedure and other problems, such as intestinal hernias and bowel distress, can also occur during a pregnancy. According to the Seminars in Reproductive Medicine review cited above in subsection on "Effect on Fertility," pregnancy after weight loss surgery should be managed by a team including a maternal fetal medicine (MFM) obstetrician, a bariatric surgeon, and a nutritionist. Strict attention must be given to ensure adequate calorie and nutrient intake. This might include additional nutritional and vitamin supplementation to meet recommended nutrient intake and weight gain during pregnancy. Weight loss surgery to treat obesity is most common among women of reproductive age. Pregnancy is safe after such procedures and can improve certain maternal and fetal outcomes. Women who wish to conceive after bariatric surgery should talk to an obstetrician and their bariatric surgeon in order to coordinate their plan and prenatal care to reduce any risks during pregnancy.